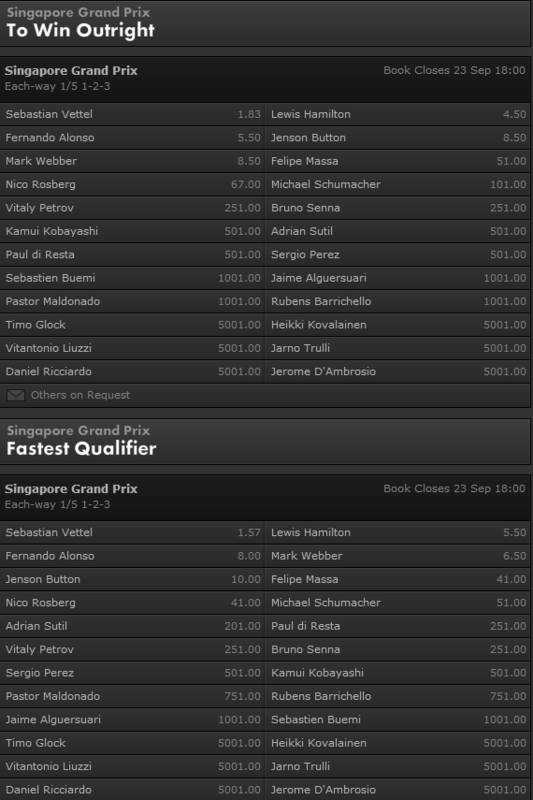 The 2011 Formula 1 season moves away from Europe and on to Asia for the Singapore Grand Prix. Alonso was last year's winner after leading every lap from pole position. Vettel came second, just 0.293 seconds behind Alonso, with Webber finishing a distant third, 29 seconds back. This Grand Prix can be a tricky event for punters, because the circuit is prone to safety-car incidents as a result of the walls surrounding the track. This is the fourth year that Singapore has hosted the event, and in all three previous years the safety car was deployed at some point. Betfair currently offers 1.21 odds (subject to change) on a safety-car to be deployed during the race. Added to the mix is the weather, with possible thunderstorms forecast and rain given a 40% likelihood on Saturday and Sunday. Newcomers to Formula 1 may be interested to know that the Singapore Grand Prix is a night race. Nice pick. Three times in a row now for him. I just got back into F1. It was boring before when Shumacher always won. How's your accuracy so far? It was not boring.. Michael had really good rivals for the title.. For example, Mika Hakkinen. Look at the F1 now. Mercedes fully dominating the races, and who will be real opponent for Lewis Hamilton?! I enjoyed watching the race. Unlike the past race which made me bored this one gives me a little excitement. Mercedes truly knows how to build a race car they have been dominating the race. Again Nico Rosberg is the leader.. But i don't believe in his championship.. I think it's last change for the german driver to get the championship.. Next years with new cars will be with Red Bull's dominating. I have watched F1 of 2000 -2013.. i was really crying.. That was real F1 racing! Again Mercedes cars are at the top after the first 2 practice sessions in Malaysia! After Lewis Hamilton's engine blow, Nico Rosberg is closing in to his title. Mercedes are again at the top in Japanese Gran Prix. But Raikkonen was too close in Practice 2. Nico is getting closer and closer to his champion title! Nico Hulkenberg is in Renault for next years. I still hope they will be stronger like in Alonso and Fisichella time.